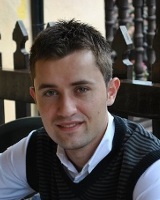 W3C welcomes Cristian Alvarez as a new staff member of the W3C Spain Office. Cristian, a strong advocate of Web standards, will be in charge of the technical issues within the Office. He has a Bachelor of Engineering in Computer Science (University of Oviedo). Before joining the W3C Spain Office, he worked as a developer in R&D departments in the steel industry, researching into computational optimization algorithms. This entry was posted in Offices, Spain and tagged staff. Bookmark the permalink.